When humpback whales breach, hundreds of cameras can be clicking on a New England Aquarium Whale Watch, trying to capture one of nature’s most majestic images. 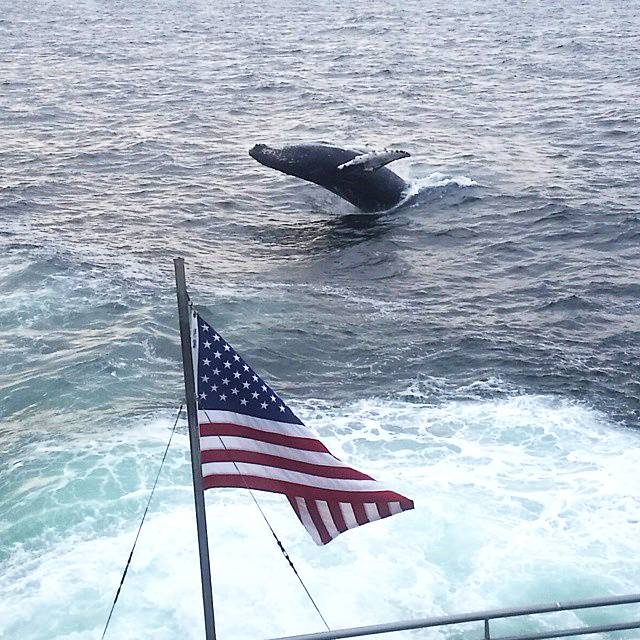 For Andrew White, a senior deckhand for Boston Harbor Cruises, which operates the Aquarium’s whale watch, he was on the back deck of the Asteria as a playful, yearling humpback made about thirty breaches in a half hour. The behavior became somewhat predictable, and White was lucky enough to not only catch a clear image of the athletic, 20-ton animal clearing the water but also capture the American flag extended in a sea breeze in the foreground. The shot was taken 25 miles east of Boston in late May at the Stellwagen Bank National Marine Sanctuary, America’s only whale feeding sanctuary, and one of the top whale watching destinations in the world. Who needs fireworks when you can have 20 tons of humpback splashing down before you? Not to mention that you can't see fireworks during the day. Check out a New England Aquarium Whale Watch this holiday weekend! Buy tickets online so you don't miss out.